the Perricone MD H2 Elemental Energy range has been created from a scientifically developed H2 Energy Complex which is powered by the smallest molecule in the universe; hydrogen. Hydrogen can quickly penetrate the skin’s surface layers, making it the perfect fast acting ingredient to combat damage caused by external factors such as stress and sun damage. Over time damage to the skin can lead to loss of moisture a slower cell renewal process. The H2 Elemental Energy range has therefore been designed with this in mind and is intensely hydrating to help instantly transform dull and tired skin. This booster serum comes in a pump dispenser and is designed for those who are concerned about dry or de-hydrated skin. It is particularly beneficial to those whose skin is prone to the effects of seasonal changes or who are regularly exposed to extreme temperature or air travel. Fear not if you have sensitive skin; this serum is lightweight, fragrance free and super gentle, yet effective. It has a clear gel like consistency and is absorbed instantly without leaving a trace. In addition to the H2 energy complex it also contains fermented yeast extract and low molecular weight hyaluronic acid, both of which help to provide deep moisturisation and optimise the skin’s water balance, leading to beautifully radiant and glowing skin. So if you are looking to improve the texture and appearance of your skin and want a lightweight oil free product then this serum is for you. 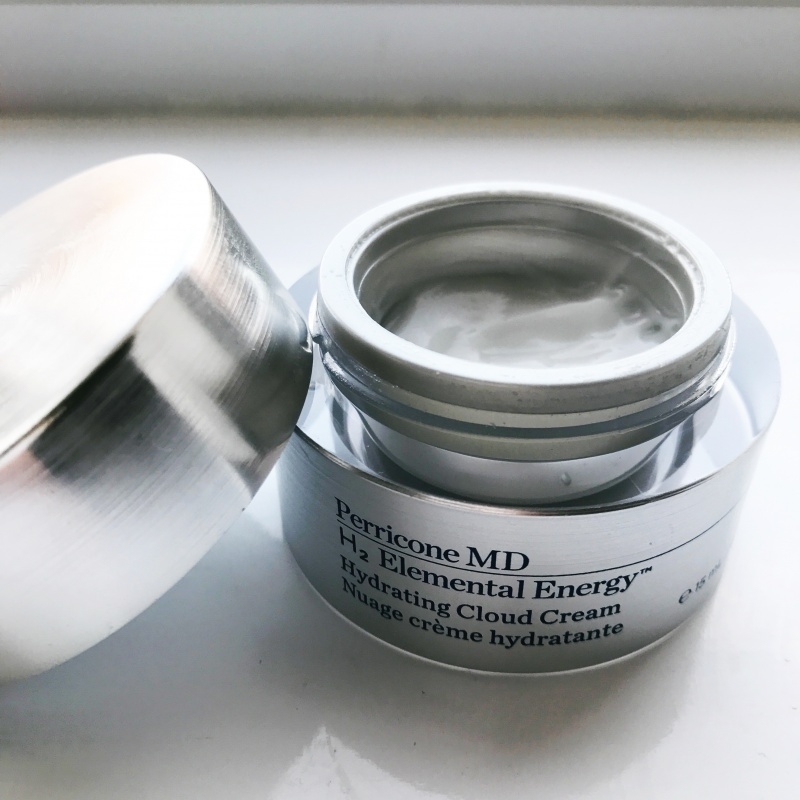 The hydrating cloud cream comes in a sleek pot and has a lightweight gel like texture which is easily absorbed. It is designed for those who need a powerful hydrating cream but want something a bit lighter than traditional rich cream moisturisers. It contains red micro algae and humectants which work alongside the H2 energy complex to attract and help maintain the skin’s moisture by absorbing moisture from the air and strengthening the skin’s own protective barrier. Perfect for those of you with dry skin that looks dehydrated, tired and fatigued. The de-puffing eye gel usually comes in a pump dispenser, however in the starter kit it comes in a 15ml tube. It has a texture similar to the hydrating cloud cream, lightweight and creamy yet rich. It provides cooling and soothing hydrating to the eye area, helping to combat ageing, puffiness and drying. In addition to the H2 elemental energy complex it contains oat kernel extract, peptides and diffusion pigments which help to smooth out the appearance of fine lines, puffiness, wrinkles and those dreaded crows feet in the eye area. Gentle, yet powerful, it is perfect for those wanting a pick me up around the eyes. 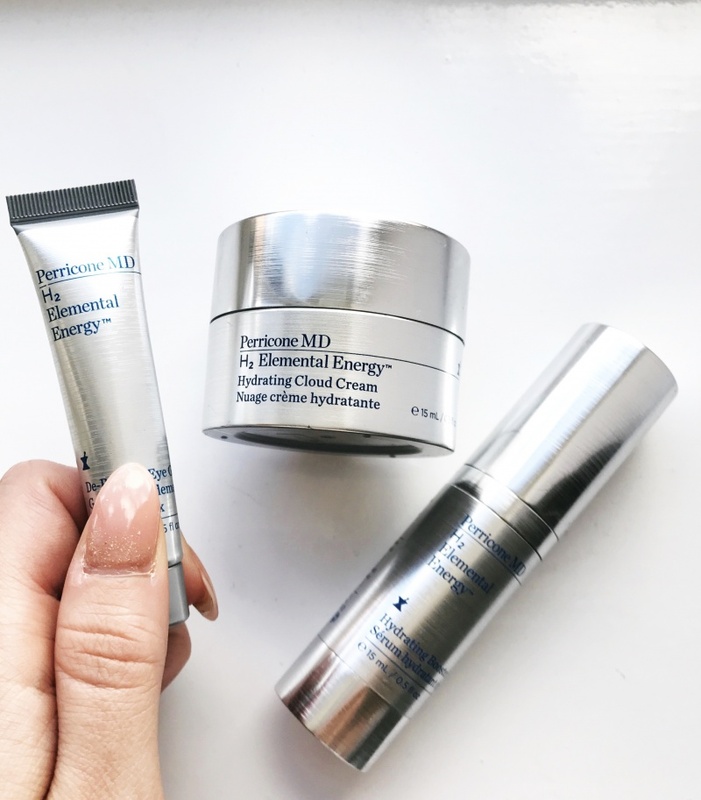 All three of the products in the Perricone MD H2 Elemental Energy range come in super sleek packaging and can be used in both the mornings and evenings, which make them the perfect multi purpose investments for your beauty routine. I personally love having a separate morning and evening skincare routine, but if skincare isn’t really your thing then this trio provides a simple and effective solution for you. I loved the fact that all three of the products had a lightweight formula that was instantly absorbed, it made life so much easier for me in a morning when time is very much of the essence! The downside for me however was that the range is fragrance free (bizarre as that may sound). I love having that little bit of pampering at the start and the end of every day and to me fragrance plays a big part in the experience of any product, so the lack of fragrance was a bit of a downside. Overall I was really impressed with the results. As someone who constantly battles with oil and shine I found that this range helped to mattify my skin, leaving a dewy glow but without that dreaded sheen. The starter kit lasted me 4 weeks, with the cloud cream being the first product to run out. I found that the booster serum and eye gel went that little bit further due to their thin consistency, but either way definitely a great little kit to introduce you to the range or for carrying on your travels. 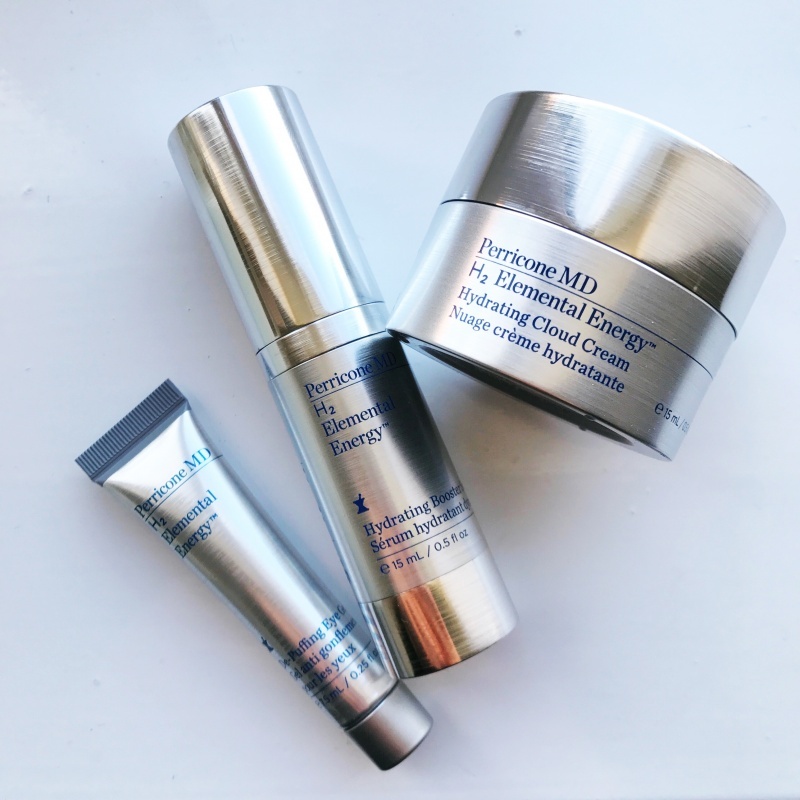 Alternatively you can try slightly smaller versions of all three products by purchasing the Perricone MD H2 Elemental Energy Ultimate Hydration Starter Kit. This is priced at £65 and contains a 15ml Hydrating Booster Serum, 15ml Hydrating Cloud Cream and 7.5ml De-Puffing Eye Gel. If you loved this review but are looking for something a little more budget friendly, you may want to check out my Super Facialist review. This post contains PR samples but all views, as always, are my own. I love in depth reviews like this one, Perricone MD is Avery well known brand and now I want to try more of their products!